Communication Access Realtime Translation (CART) is a word-for-word speech-to-text translation of all spoken words and environmental sounds. It benefits people who are hard of hearing, late deafened or oral deaf. 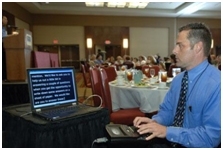 The CART captioner uses a steno machine (like those used by court reporters in a court room) a computer and realtime software to provide instant speech-to-text translation. The text can be displayed on a computer monitor or other display when used by a single person or small group. Text can be displayed on a large screen when used by a large group. CART captions can be provided on-site or remotely and can be streamed to personal laptops, tablets and smartphones. CART is beneficial in many different listening environments. Imagine a student – K-12 or post-secondary – having full access to all of the communication that takes place in a classroom. Or, what would it be like to hear every word spoken at a government or civic function as well as conventions and conferences. People who cannot hear often feel excluded at religious services, funerals and weddings. CART can provide communication access in nearly every communication situation. In its brochure, CART – Communication Access to people who are Deaf or Hard of Hearing, the National Court Reporters Association (NCRA) states, “The Americans with Disabilities Act (ADA) mandates the elimination of discrimination against people with disabilities. Under the ADA, CART is recognized as an assistive technology that affords ‘effective communication access.’ “ Thus, it is the right of any person with a hearing loss to request CART as an accommodation for any situation where they would be excluded from participating because they could not hear what was being communicated. The benefits of captioning are numerous. The ability to participate fully in life which leads to confidence to join into conversations and take an active part in one’s community. Equal access to communication can lead to satisfaction in one’s personal and professional life. The freedom to choose how one accesses communication is empowering and leads to independence.